Henry VII (January 28, 1457-April 21, 1509), King of England (August 22, 1485-April 21, 1509), was the founder of the Tudor dynasty and is generally acknowledged as one of England's most successful kings. Henry Tudor was the posthumous son of Edmund Tudor, a half-brother of King Henry VI of England. His mother was Margaret Beaufort, a descendant of King Edward III on the wrong side of the blanket. From his father, he inherited the title Earl of Richmond; from his mother, his questionable claim to the throne of England. He was born in Pembroke but grew up in exile in Brittany, having fled from the Yorkist kings of England. As an individual with some claim to the throne (even a very vague one), he knew the Yorkist monarchs would want him dead. After the failure of the revolt of his cousin, the Duke of Buckingham, Henry VII became the leading Lancastrian contender for the throne of England. Having gained the support of the in-laws of the late Yorkist King Edward IV, he landed with a force in Wales and marched into England, accompanied by his uncle, Jasper Tudor, a military mastermind. Wales had traditionally been a Yorkist stronghold, and Henry owed the support he gathered to his ancestry, being directly descended, through his father, from the Lord Rhys. He amassed an army only slightly smaller than the king's and travelled north. There his Lancastrian forces decisively defeated the Yorkists under Richard III at the Battle of Bosworth Field in 1485. This victory ended the long-running Wars of the Roses between the two houses. Henry's claim to the throne was tenuous and based upon a lineage of illegitimate succession. However, this was no barrier to the throne, since, in the absence of an Act of Succession, in practice Parliament had the ability to award the crown to whomever it pleased (technically, the Council of Accession awarded the Crown - and still does so to this day, though now under direction). Henry won it by conquest. Primary of Henry's concerns on attaining the monarchy was the question of establishing the strength and supremacy of his rule. There were few other claimants to the throne left alive after the long and bloody civil war, so his main worry was pretenders such as Perkin Warbeck, who were backed by disaffected nobles. Henry succeeded in securing his crown by a number a number of means but principally by dividing and undermining the power of the nobility. Henry's first action was to declare himself king as-of the day before the battle, thus ensuring that anyone who had fought against him would, technically, be guilty of treason. It is interesting to note, therefore, that he spared Richard's designated heir, John de la Pole, Earl of Lincoln. He would have cause to regret his leniency two years later, when Lincoln rebelled and attempted to set a boy pretender, Lambert Simnel, on the throne in Henry's place. Lincoln was killed at the Battle of Stoke, but Simnel's life was spared and he became a royal servant. Simnel had been put forward as "Edward VI", impersonating the young Edward, Earl of Warwick, son of George, Duke of Clarence, who was still imprisoned in the Tower of London. Henry had shown uncharacteristic leniency in dealing with Edward and did not find a pretext for executing him until he had grown into adulthood, in 1499. Edward's elder sister, Margaret Pole, who had the next best claim on the throne, inherited her father's earldom of Salisbury and survived well into the next reign. Arthur, Prince of Wales (September 20, 1486-April 2, 1502). Margaret Tudor (November 28, 1489 - October 18, 1541). Henry VIII of England (June 28, 1491 - January 28, 1547). Elizabeth Tudor (July 2, 1492 - September 14, 1495). Mary Tudor (March 18, 1496 - June 25, 1533). 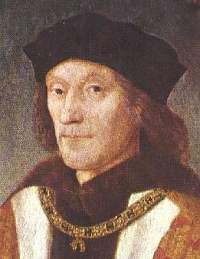 Edmund Tudor, Duke of Somerset (February 21, 1499 - June 19, 1500). Katherine Tudor (February 2, 1503 - February 2, 1503). Henry was a fiscally prudent monarch who restored the fortunes of an effectively bankrupt exchequer by introducing efficient mechanisms of taxation. In this he was supported by his chancellor, Archbishop John Morton, whose "fork" was a catch-22 method of ensuring that nobles paid the appropriate taxes. Royal government was also reformed with the introduction of the King's Council that kept the nobility in check. Henry's policy was both to maintain peace and to create economic prosperity. Up to a point, he succeeded in both. He was not a military man, and had no interest in trying to regain the French territories lost during the reigns of his predecessors; he was therefore only too ready to conclude a treaty with France that both directly and indirectly brought money into the coffers of England. To strengthen his position, however, he subsidized shipbuilding, thus strengthening the navy and improving trading opportunities. By the time of his death, he had amassed a personal fortune of a million and a half pounds; it did not take his son as long to fritter it away as it had taken the father to save it up. As well as coming to terms with the French, Henry forged alliances with Spain -- by marrying his son, Arthur Tudor, to Catherine of Aragon; with Scotland -- by marrying his daughter, Margaret, to King James IV of Scotland; and with Germany, under the emperor Maximilian I. In 1502, fate dealt Henry a double blow from which he never fully recovered: His heir, the recently-married Arthur, died in an epidemic at Ludlow Castle and was followed only a few months later by Henry's queen, in childbirth. Not wishing the negotiations that had led to the marriage of his elder son to Catherine of Aragon to go to waste, he arranged a dispensation for his younger son to marry his brother's widow -- normally a degree of relationship that precluded marriage in the Roman Catholic Church. Henry obtained a dispensation from Pope Julius II but had second thoughts about the value of the marriage and did not allow it to take place during his lifetime. Although he made half-hearted plans to re-marry and beget more heirs, these never came to anything. On his death in 1509, he was succeeded by his second son, Henry VIII. Henry's elder daughter Margaret was married first to James IV of Scotland, and their son became James V of Scotland, whose daughter became Mary Queen of Scots. By means of this marriage, Henry hoped to break the Auld Alliance between Scotland and France. Margaret Tudor's second marriage was to Archibald Douglas; their grandson Henry Stewart Lord Darnley married Mary Queen of Scots, whose son was James VI of Scotland, who inherited the throne of England as James I after the death of Elizabeth I. Henry VII's other surviving daughter, Mary, married first King Louis XII of France and then, when he died of too much honeymooning, Charles Brandon, Duke of Suffolk. Their daughter Frances married Henry Grey, and their children included Lady Jane Grey, in whose name her parents and in-laws tried to seize the throne after Edward VI of England died. King Henry VII is buried at Westminster Abbey. The Son of Prophecy: Henry Tudor's Road to Bosworth (©1985) by David Rees (ISBN 0-85159-005-5) is a discussion of how Henry's return to Wales was regarded by some as the fulfillment of a Messianic prophecy.